Sharing our equine research program with international colleagues in Calgary. Dr. Rachael MIlwid talks about her proximity sensing study and network epidemic model. What a great start to fall 2018! It was an absolutely fantastic experience to attend the first annual International Equine Symposium in Calgary in September 2018. Rachael, Tanya and I each presented different equine projects that we have been conducting in Ontario and the feedback was really fantastic. It was a great way to interact with equine practitioners, researchers and students and wrapped up with an absolutely wonderful evening at Spruce Meadows to watch the 6-bar jumping event. We can’t wait to return next year to share updated results! Lead up to the 6-bar jumping event at Spruce Meadows. Fall is the most wonderful time of year! 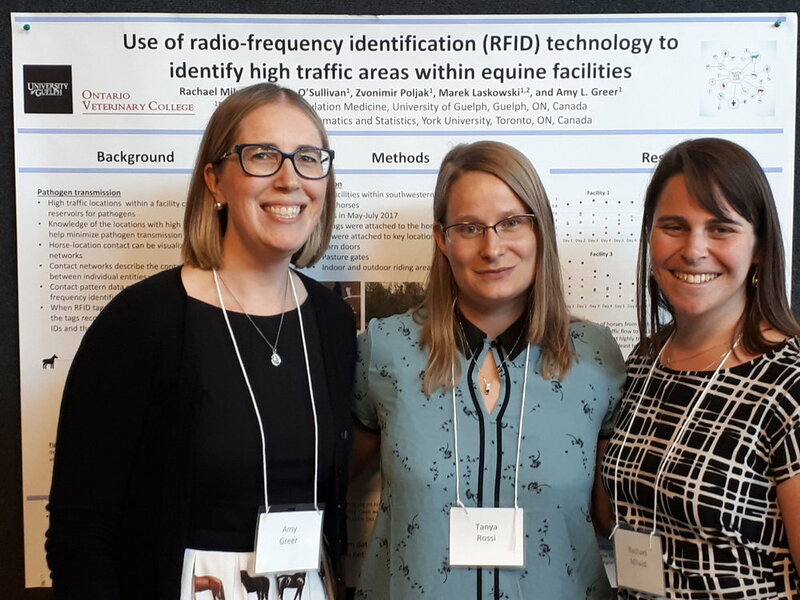 Members of the math.epi.lab at the end of the Centre for Public Health and Zoonosis Annual Research Symposium in June 2018. 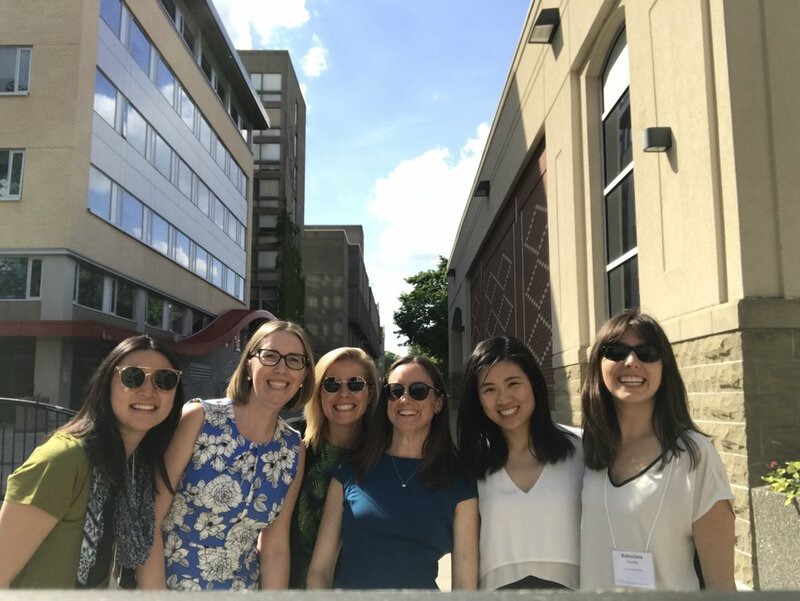 From left to right: Elissa Giang, Dr. Amy Greer, Melanie Cousins, Emma Gardner, Wendy Xie, and Roksolana Hovdey. With fall comes the start (continuation?) of the academic travel season. Are you wondering where you might find members of the math.epi.lab this fall? We will be presenting our most recent research findings in Canada, the US, and Thailand so we will be "in transit" quite a bit this fall. Be sure to catch up with us if you are planning to attend any of the following conferences and events. The most wonderful time of year...CRWAD 2017! Every year in early December the Veterinary Epidemiology community comes together in Chicago for the Conference for Research Workers in Animal Disease (CRWAD). This year our group contributed three oral presentations (Rachael Milwid, Melanie Cousins, and Kelsey Spence) and one poster presentation (Rachael Milwid) at the conference. I also served as the session moderator for the Modeling and Network Analysis session along with Kristen Davenport from Colorado State. Rachael presented two different projects related to her work on equine contact networks and Melanie presented her work on the development of a mathematical model for Campylobacter in Ontario. Since Kelsey is in the UK, I presented her longitudinal study of equine movement patterns. All of our projects were very well received by the audience and the Department of Population Medicine was well represented with a very large group of attending graduate students. Melanie giving her oral presentation in the ecology of food-borne pathogens session. The Magnificent Mile is quite magnificent in December! Fall is always a busy time of year and many of the important infectious disease related meetings are held during the autumn months. Over the last several weeks I have attended a number of meetings that I felt were important to highlight on our team blog because they were so incredibly exciting to be a part of. On October 4th and 5th, I travelled to Ottawa to participate in a meeting co-hosted by the Nunavut Government and Inuit Tapiriit Kanatami (ITK). The purpose of the meeting was to develop a comprehensive action plan for the elimination of Tuberculosis across Inuit Nunangat with specific goals and priority areas for action. It was an honour to be asked to participate and I am optimistic that with improved infrastructure and support to Northern health systems, TB elimination is a real possibility. The meeting was held at the Uppsala castle in Uppsala, Sweden. (photo credit: A. Greer, 2017). October also marked the 3rd annual Uppsala Health Summit. The Uppsala Health Summit is a recurring international policy arena for dialogue on challenges for health and healthcare, and how we can overcome them. The theme changes each year which makes it a dynamic and exciting event to participate in. Personally invited decision makers, opinion formers and experts participate in active dialogue in thoroughly prepared workshops and plenum sessions. The theme of the summit this year was Tackling Infectious Disease Threats: Prevent, Detect, Respond using a One Health Approach. It was a great opportunity to catch up with some colleagues that I had not seen in many years and also to meet some new researchers working in this area. Final dinner in Uppsala with great company and discussion. From left to right: Fernanda Dorea (National Veterinary Institute, Sweden), Florence Haseltine (Society for Women's Health Research, USA), Crawford Revie (Atlantic Veterinary College, Canada), Stefan Widgren (National Veterinary Institute, Sweden), Kun Hu (IBM Research, USA), Amy Greer (Ontario Veterinary College, Canada) and Stefan Engblom (Uppsala University, Sweden).